GBC Motorsports Performance ATV and UTV tires are built to get you over tough terrains to your destination. 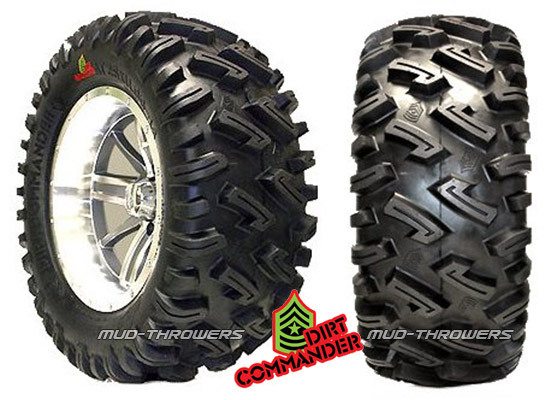 GBC's Dirt Commander is a super tough 8-ply rated, all-terrain tire that gives you excellent puncture resistance. Its siped tread design also gives additional biting edges for better traction in all terrains. Perfect for dirt riding, loose, hard-pack, and all-terrain! Up to 1120 lbs load carry capacity (14 psi), perfect for the heavier UTVs! Up to 1050 lbs load carry capacity (7 psi), on 29" - 30" tires! i put these on a Polaris 850xp.I use them for trails, hills and a ton of bush wacking. (hunting) there is nothing you can't drive thru or over. rocks,sticks or mud holes they do it ALL! i put 1200 miles on these tires with 1/8th inch of wear.they handle very well at high speeds(50mph)corner V/G and great on side hills. truly bullet proof.